This ancestral home was built by P C Sarcar for his wife Kanchan Lata in 1930 and is one of the few well maintained bungalows of its kind left in Allahabad. 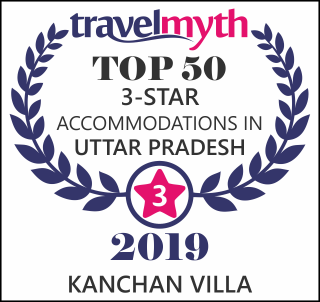 Hospitality takes on a new meaning at Kanchan Villa, where you are offered not just personalized service and comfort, but also a slice of tranquility. Almost a century old home, sheltered by gnarled, leafy old mango trees, time stands still here. Wake up to the call of birds and drift off to sleep to the peace and stillness that only a home such as this can offer. A burst of yellow glory from the laburnum, arches high above the front door and fat goldfish dart about in a quiet, pool at the entrance. Barely a kilometer away from the railway station and a 20 minute drive from the airport, Kanchan Villa offers you convenience and an array of choices. Hosts Ivan and Purnima Lamech have a history of hospitality and go out of their way to ensure that your stay is comfortable and memorable. All you have to do, is give them the opportunity.